Buy 8MHZ CRYSTAL Oscillators Online at LOW COST in India on www.dnatechindia.com. Delivery all over India. This is a 8MHZ Crystal. This is a low cost crystal oscillator with oscillation frequency of 8Mhz. 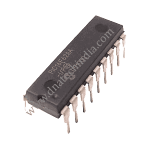 Crystal are normally required to provide clock pulses to your microcontroller or other IC's which require external clock source.